A major office and industrial park built in Gateshead to the south of the MetroCentre, comprising 60,000ftsq of B1 office space and 85,000ftsq of industrial space in a landscaped setting on the south bank of the river Tyne. A new riverside promenade was incorporated into the design and pedestrian and vehicular links to the MetroCentre were an important element of the scheme. 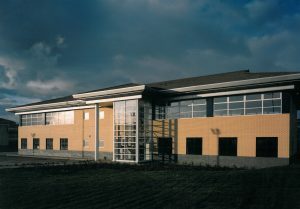 The office buildings were steel framed, clad in a buff and blue engineering brick, whereas the industrial units are clad in horizontally aligned silver pvf2 coated cladding on a blue brick plinth.